Launched in 2008, Prime Loops award-winning team of specialist product engineers, audio technicians & sound designers have lovingly created every single sound library, with the highest attention to detail. Sounds from Prime Loops libraries have been featured in many chart-topping tracks from artists such as Lady Gaga, Skrillex, Chris Brown, Doctor P, Beyonce, Crookers, Nicole Scherzinger and many more. 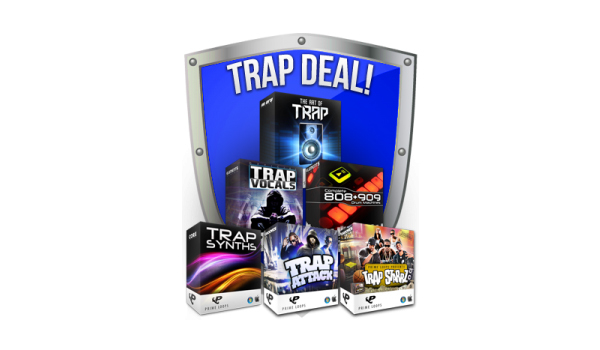 Caught the Trap bug yet? We’ve got the right medicine for you… Coming straight from the Prime Loops lab we prescribe our BIGGEST Bundle yet - ‘Trap Producer’! This aggressive blend of Southern Hip Hop, Crunk and Dutch House has quickly taken over the map and made its mark on both mainstream & underground music. - Damn Son! 90 straight-up Trap phrases to bring some signature verbal attack to your mix! - 260+ Pristinely recorded 808 & 909 drum machine samples! Sub thumping kicks, bass hits & crisp snares & more essential sounds for that authentic Trap sound! - 300+ Badass Trap drum loops, booming basslines, dramatic synth hooks & more! Organised into 10 construction kits for your remixing pleasure, you’ll be sure to cause some damage to any in car entertainment system! - 380MB of Venomous Trap synth loops; featuring spooky Trap arpeggios, submerged basslines, rhythmic lead loops, quaking pads, FX & more! - 375MB of next level Trap swagger! Loaded with sweeping sub-bass, drum loops, searing synths and sonorous SFX to keep the club bouncing all night long! - Arm yourself with over 500Mb of the hottest super-slow, tricked-out Trap rhythms, ultra-subterranean bass, operatic trap synth leads and so much more sound material to seriously step up your game.